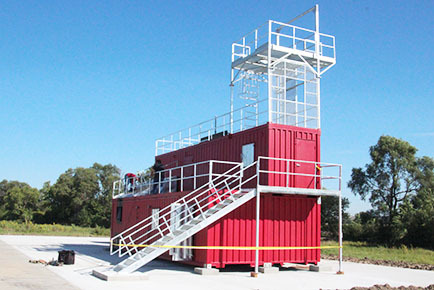 A new fire and rescue training facility arrived Tuesday from Fire Training Structures, LLC, of Phoenix, AZ. A crane was being used to unload the components from two semi tractor-trailer units. The workers said they expect the new facility to be completed within three days, and the fire department will receive instructions on how to use it. 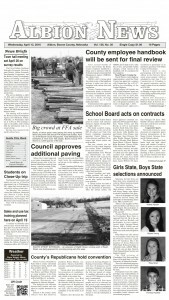 Albion City Council accepted a $208,355 bid for the new structure last May. The cost will be shared by the lbion Volunteer Fire Department and Albion Rural Fire District 1. The facility will allow coordinated training with other area departments and enable the Albion department to host specialized training courses, according to Fire Chief Bruce Benne. The structure will allow various types of live fire training, interior attack, roof ventilation, and search and rescue. It will include a rappelling tower that can be used for training in grain bin or rope rescue. This will be the first training structure of its kind in the area. It is intended for use by volunteer departments within a radius of 40 to 50 miles. Benne noted, for example, the facility could be used by the 18 member departments of the Mid-Nebraska Mutual Aid Association.